Maddy the terrier mix (believed to be Schnauzer / Husky). Sparky, the Pembroke Welsh Corgi mix—"His mother was full-blooded Pembroke Welsh Corgi and the daddy was a mix; we really don't know of what nature other than a shaggy mutt. Sparky is 6 years old in these photos. He was adopted when he was only 6 weeks old from a breeder at a horse stable. His favorite toy is "Mr. Football." We left his tail like it was because it has white hair on the very tip of it and I just did not want to dock his tail because I hear that is painful." 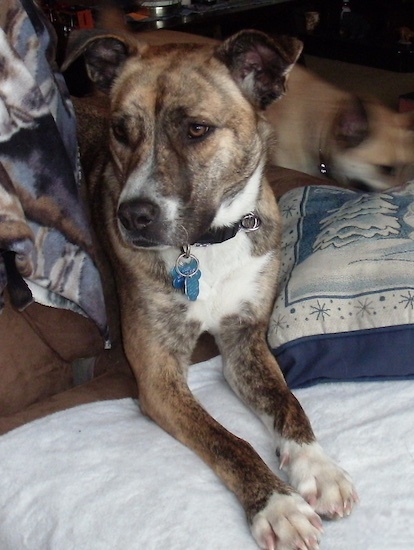 Bax the red brindle Feist mix has a special talent of being able to say "Mama. "Watch Bax say "Mama" in the above video. "This is Allie at about 1 year old. We were told she is a Pitbull mix and rescued her from an animal shelter in NJ. I have said, in the past, that I would never get a Pitbull. I never wanted one because of the "things" said about them. We did not go to the shelter looking for her, she spoke to us. The eye contact was made and we brought her home. She has a wonderful relationship with our Shepherd and is unbelievably gentle and tolerant with our children. Her manners are exceptional. A wonderful addition to our family and I no longer believe what anyone says about the breed. We take her for walks and play a lot with her. Our home is now complete with the pitter patter of Pit Bull feet." "Rocco the Boston Bull Terrier / Chihuahua mix. Mini Boxer looking, great apartment dog, kid friendly, low shedding, and an excellent temperament. No breathing problems because he has a longer snout than a Boston."